Kevin McKiernan's career as a journalist and filmmaker has taken him to some of the world's most troubled regions, from Nicaragua to Iraq to West Africa; his work, nominated for the Pulitzer prize, has been published by Time, Newsweek and The New York Times, and appeared on ABC, CBS, NBC and PBS. Studs Terkel called McKiernan’s book, THE KURDS: A People in Search of Their Homeland (St. Martin’s Press, 2006), “astonishing.” McKiernan wrote and co-produced The Spirit of Crazy Horse (PBS Frontline) and wrote, directed and produced Good Kurds, Bad Kurds (PBS Independent Lens), which screened at over forty film festivals and won ten awards. 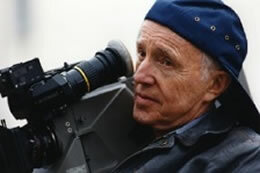 Oscar winner Haskell Wexler is best known for two features, Medium Cool, a groundbreaking film shot during the Democratic convention in Chicago, and Latino, shot in Nicaragua, which received a special honor at the Cannes Film Festival. Both films broke the mold of conventional storytelling by using the immediacy of documentary-style filmmaking. Wexler has directed over 50 documentaries, rock videos and award-winning commercials, including The Bus, Bus II, and Bus Riders Union, Introduction to the Enemy (shot in Vietnam), Interview with My Lai Veterans, which also won an Academy Award, No Nukes (with Barbara Kopple), and Target Nicaragua: Inside a Secret War. As a cinematographer, Wexler has photographed a wide range of films that have earned him five Academy Award nominations and two Oscars for Best Cinematography. His nominations came for his work on his first feature documentary, The Living City (a short film), T for Tumbleweed, Milos Forman's One Flew Over the Cuckoo’s Nest, John Sayles' Matewan, and Touchstone Pictures Blaze. He won Academy Awards for Mike Nichols' Who’s Afraid of Virginia Woolf and Hal Ashby's Bound for Glory. Other films shot for Ashby include Coming Home, Second-Hand Heart and Lookin’ to Get Out. Wexler and Kevin McKiernan shot Good Kurds, Bad Kurds.